Welcome to the website for my psychological thrillers! I'm Paul Teague, writing as Paul J. Teague. If you love to read books by Harlan Coben, Linwood Barclay or Mark Edwards, then you're sure to like my stories. 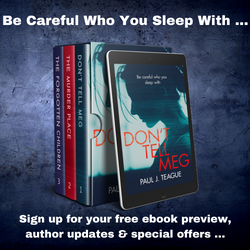 You'll find all sorts on information on this website – examples of my early thriller writing, galleries showing key locations from my books and many links which will allow you to explore my various social media sites and other websites. If you want to get in touch, please don't hesitate to to click the Contact Me button at the top of this page. In the meantime, thanks for reading my books and I hope that you enjoy the content on this website.